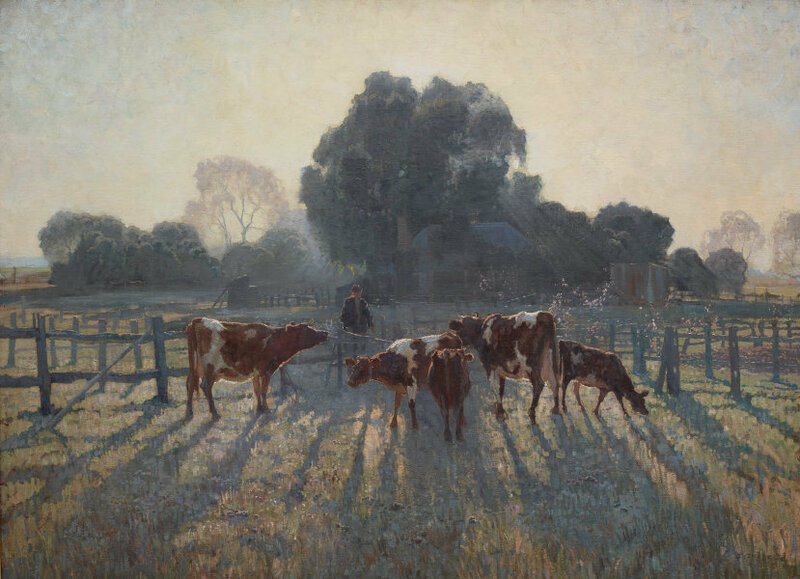 Awarded the Wynne Prize in 1919 and painted the same year as Roland Wakelin's and Roy de Maistre's experiments in colour harmony, 'Spring frost' is one of Elioth Gruner's most critically acclaimed achievements. With its impeccable sense of light and tone, and its vigorous foreground brushwork, 'Spring frost' is a tour de force, and perhaps the most loved Australian landscape painting in the Gallery. Elioth Gruner painted 'Spring frost' according to 19th-century plein-air conventions, but the work also demonstrates a contemporary succinctness of form. To complete the painting - one of his largest compositions - en plein air, Gruner built a structure to protect the canvas from the weather, and wrapped his legs with chaff bags to avoid frostbite. Although painted largely outdoors at Emu Plains, its large size and somewhat theatrical quality make it likely that Gruner completed parts of it later, in his city studio. This work was acquired by the Gallery in 1939. Signed and dated l.r., black oil "E GRUNER/ 1919".